The If I Were a Ewing blog has a go-to list of Dallas information. Central to the definition of a television program that rises above others to become a cultural icon is the ability to move generations of TV viewers, leaving a lasting impression in both their hearts and minds. Programs such as Gunsmoke, I Love Lucy, Friends and Charlie’s Angels — as well as many other Aaron Spelling shows from the 1970s — are joined by Dallas in this elite circle. Although Dallas was not the first primetime soap, an honor that goes to the 1960s drama Peyton Place, it forever changed series television when it debuted as a miniseries in 1978 with compelling characters anchored in primal archetypes that fascinated viewers, spawned an endless list of imitators and set the tone for the high-flying, glamorous ’80s. Nearly 35 years after the Ewings were introduced on CBS, their legacy is being continued by executive producer Cynthia Cidre and her team for a summer run on TNT that will determine whether iconic TV characters can indeed come home again. Updating classic TV brands from the past, whether as sequels, reboots or “reimaginings,” is nothing new and it’s rarely a sure-fire recipe for success. Hawaii Five-0 is the rare bright spot in a recent spate of failed attempts to reignite viewer interest in vintage TV shows. Witness ABC’s lackluster Charlie’s Angels and V, NBC’s morose reboot of The Bionic Woman and The CW’s quick eviction of Melrose Place despite the mid-stream addition of original Melrose villainess Heather Locklear. No amount of flash and gloss can make up for engaging storytelling, and more important, good chemistry among a show’s cast. Time will tell whether TNT’s Dallas revival will succeed in connecting with modern viewers whose attention span is more divided by technology, not to mention hundreds of cable TV offerings. The dynamics among the new Dallas stars and the veterans are still marinating and will hopefully come to a boil by the airing of the final episode of its initial ten-episode run on August 15. A good sign of the show’s potential is the reaction of fans, both longtime and new, on social media, which is the new barometer of popularity in the digital age. 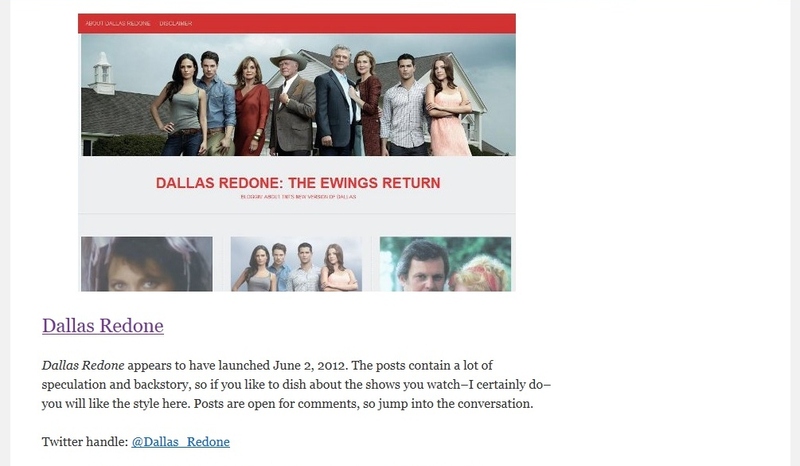 Dallas fan sites are in some ways the new focus group, tracking the show’s backstage moves, scrutinizing plot points and offering analysis and insight that fans turn to in their hunger for answers to questions about the Ewings’ past, present and future. Blogger Tammi Kibler, who runs “If I Were a Ewing,” has curated a helpful list of online sources for a wide range of Dallas information with her recent post Top 6 Blogs for the Dallas TV Show on TNT. I’m very happy to say Dallas Redone has been included in the list along with Dallas Decoder, Dallas Fan, Dallas Fanzine, Dallas TV World and Ultimate Dallas. The sites have their own signature tones and features, offering a well-rounded source of Dallas information and fun to the viewers who are rooting for the show’s success. Check out Tammi’s post for the full scoop and links to the other sites. She’s on Twitter at @ifiwereaEwing. Don’t forget to post comments on the sites and share content you like on Facebook, Twitter and any other social media accounts you may have. The louder our clamor for Dallas on TNT, the bigger the chances are that we’ll get a second season! Thank you so much for highlighting my post here. It’s fun and empowering to have social media outlets through which we can demonstrate our interest in the shows we watch. You’re very welcome, Tammi! Thanks for giving Dallas fans a great reference for information. Together we can keep the show in the spotlight!